There is so much stuff going on these days, it's kind of hard to keep up. Heck, the past two weeks have included the launch of A Pius Man, as well as the launch of SuperversiveSF's Astounding Frontiers #1: Give us 10 minutes and we will give you a world, which is Superversive's answer to the Pulp Revolution. You can hear several of the authors in issue #1, as well as the founders of the Pulp Revolution discuss both the Magazine and the revolution itself on yesterday's podcast. (Yesterday's post). Anyway, Astounding Frontiers #1 features a whole bunch of interesting people. Yeah, these guys are awesome. Astounding Frontiers is a new pulp magazine from the minds at Superversive Press that will transport you to far off worlds of adventure! In our inaugural issue we have stories and serials from Dragon Award winners and nominees and many other great authors. We have stories from Dragon Award Nominee Declan Finn, Patrick S. Baker, Lou Antonelli, Erin Lale and astrophysicist Sarah Salviander. We have the first instalments of three serials. Nowither, the follow up to John C. Wrights Dragon award winning Somewhither, Galactic Outlaws, from Dragon Award winner Nick Cole and Jason Anaspach and a rollicking adventure from Ben Wheeler called In the Seraglio of the Sheik of Mars . Speaking of short stories and anthologies, remember the Trumptopia short story collection? It was an idea where they would be a collection of short stories about how amazingly awesome Trump is -- genres of SF, fantasy, etc. The same company had already done a "Trumpocalypse" collection, so the call for open submissions pitched this as the opposite end of the spectrum. .... And then the cover had Trump looking in a cabinet, at his collection of heads in jars. There was a very, very quick writer revolt. And by quick it started on ... Wednesday. By the time I had heard about it on Thursday night, it was well under way. There was a conversation about changing the cover, and it looked like there would be a second cover. I thought the whole thing would blow over by Monday. Had a new cover already drafted by ... wait for it ... Dawn Witzke. By the way, there were problems with the short story that came with the mailing list. Click here to sign up, and it should be available. The short this month connects to A Pius Man: A Holy Thriller. It's called The Pirate King. 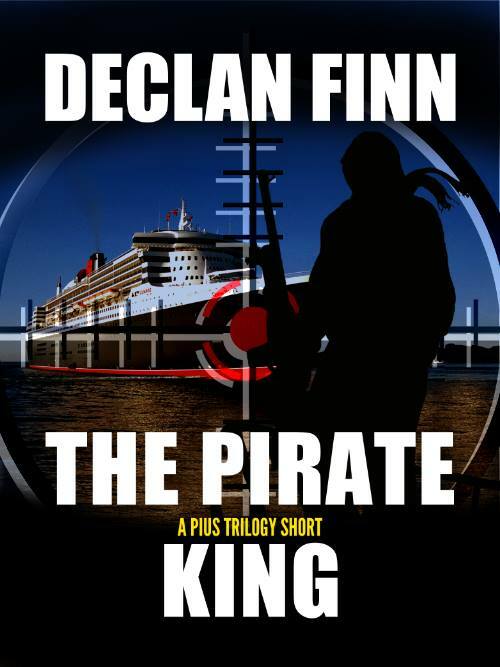 The leader of a band of Somali Pirates calls himself the Amir of The Sea. But when he decides to take on the world's largest cruise ship, he may have bitten off more than he can chew. Will this be the "Amir's" greatest victory? 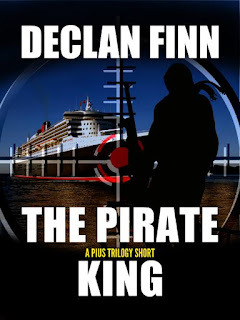 Or will it be checkmate for the Pirate King? And once you've done that, you might want to check out the novel, A Pius Man-- though if you already have read it, I ask you post a review. Even if you weren't thrilled with it ... okay, if you hated it utterly, feel free to lie a little on Amazon. Heh. Yes, I'm kidding. A review is a review.